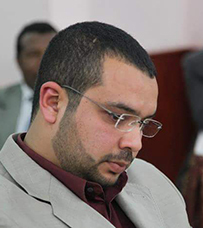 Ezieddin Emahjub completed his LLB degree and Master of Civil Law by research at Univrstiy of Tripoli in Libya. In January 2010, Ezieddin moved to Australia and completed his Master and PhD degrees in intellectual property at QUT. Before joining UNE, Ezieddin held research and teaching positions at Univrstiy of Tripoli, QUT and the Australian Catholic University. Since 2009, Ezieddin taught at both undergraduate and postgraduate levels. His teaching experience includes Torts, Contracts, Law in Context, International Business Law and International Business Transactions. In January 2014, Ezieddin completed a PhD thesis which proposed a novel theory of intellectual property based on Islamic legal philosophy. Since completing his PhD, Ez published several research papers in areas that include IP and Islamic legal philosophy and IP and development. His current research agenda includes three new projects on copyright law and distributive justice, open information policy and access to knowledge in the developing and developed world. Ezieddin also worked as an attorney for a leading law firm in Tripoli, Libya advising several multinational companies including Exxon Mobil and ABB Ltd on employment law, investment law, tax law and dispute resolution. Ezieddin Elmahjub, ‘Situating Intellectual Property Policy into a Human Development Paradigm’ (2015) World Intellectual Property Journal. Ezieddin Elmahjub, ‘A Case for Flexible Intellectual Property Protection in Developing Countries: Brief Lessons from History, Psychology and Economics’ (Forthcoming) European Intellectual Property Review. Ezieddin Elmahjub, ‘Intellectual Property and Development in the Arab World: A Development Agenda for Libyan Intellectual Property System’ (Forthcoming) Arab Law Quarterly. Ezieddin Elmahjub , ‘An Islamic Perspective on the Theories of Intellectual Property’ in Brian Fitzgerald and John Gilchrist, Copyright Perspectives - From Roman Law to the Cosmos (Springer, 2015). Ezieddin Elmahjub with other contributors ‘Limitless Information: The Challenge for Copyright’, Cultural Science Journal, 2014. Ezieddin Elmahjub, ‘Foundations of Moral Rights in Islamic Sources and History of Authorship in Islamic Civilisation’ IIUM LAW JOURNAL, Vol 22, 2014. Ezieddin Elmahjub ‘Facebook Versus Ghaddafi: Social Networking as a Tool for Democratic Change in Libya’ in Helen Sykes, Space, Place and Culture (Future Leaders, 2013) 72-89. “A2K: An Islamic Perspective” 14th CCI Symposium - Brisbane 2 April. “Islamic Shari’s and the Design of Fair and Efficient Intellectual Property Laws” Australasian Intellectual Property Academics’ Conference, 6-8-Feb 2014, Brisbane. “Islamic Shari’a and the Promotion of Innovation and Creativity”, Oxford Symposium on Religious Studies, Oxford University, England, 2-4-Dec 2013. “The Protection of Intellectual Property (IP) in Islamic Shari’a and the Development of the Libyan IP System”, QUT Research Colloquium, Brisbane, 29 November 2013. “Promoting Innovation and Creativity an Islamic Perspective”, Keynote speaker at Australian Catholic University’s Law School Luncheon, Melbourne, 25 April, 2013. “The Protection of Intellectual Property in Islamic Shari’a and the Development of the Libyan IP System”, Winner of QUT Law School 3 Minutes Thesis Competition (Presentation Competition) 20-Aug, 2013.